Exploration & Invasion to Goldrush. Exhibition : 10 – 18 March. Launch Sat 10th 6 – 7 pm. Exploration, Invasion, Land rush to Gold rush. 1836 – 1851. Before the wild and heroic Victorian Gold Rush(s). My aim is to connect viewers and communities with our local environment and history, acknowledging and re-imagining Indigenous presence, lifeways, and cultural heritage. My works combine my passion for nature and history, travel and pre-colonial landscapes in my narrative. I seek to reveal Indigenous Cultural Landscapes, to revisit with new eyes, our region of central Victoria – Djaara country. 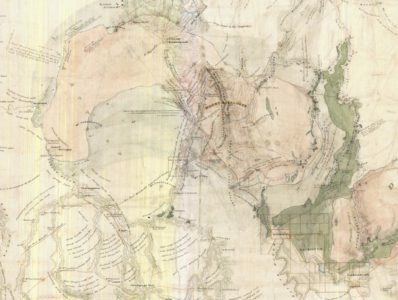 Following Major Mitchell’s ‘discovery’ of “Australia Felix” (the happy or abundant Australia) and the explosion of colonial settlement, I explore and reveal the pastoral invasion, Indigenous Dispossession, environmental degradation and cultural change, leading up to the gold rushes. 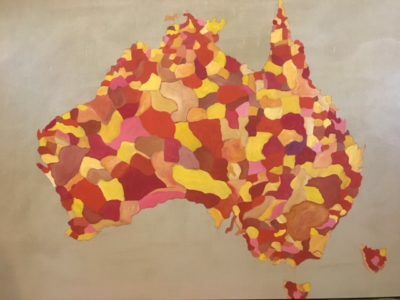 Utilising maps, text, images and archives, my paintings create a ‘Visual Narrative’ of my insights into the cultural and natural environment of Jaara Country – the lands of the Dja Dja Wurrung. The original inhabitants, the Dja Dja Wurrung, lived in this area of central Victoria for +- 30,000 years before exploration brought word of the ‘Australia Felix’ – the happy / abundant Australia. Re-evaluation of indigenous culture and lifestyle through images, maps and wider reading, reveals a different picture than previously painted. Aboriginal land management, cultivation and hunting techniques rewrite the story: not subsistence nomads but many highly evolved and organized family groups, living in an abundant environment, practising complex social, cultural and religious traditions. The indigenous ‘nomadic’ life carefully and respectfully managed the clans’ territorial country and ensured abundant resources. The narrative of pastoral invasion is significant, complex and overlooked, despite spanning the fifteen years immediately prior to the 1851 gold rush. Vast flocks of sheep and cattle were introduced into cultivated Indigenous landscapes, and they thrived. The waterways, previously described as a meandering chain of ponds, changed over fifteen years of use by squatters, to rushing and eroded creeks. The squatters selected and took up areas of land, always with the best access to water. The luscious verdure of grasses and herbage was rapidly diminished. This unpredictable, rapid and violent invasion was overshadowed by heroic stories of colonial hardship and by the ‘smoke and mirrors’ of gold rush settlement beginning in 1851. The history of this region is written in its landscape and the land sets a stage for stories, myths and spiritual connections to be made. Forest Creek was the heartland and home range of the Galgal Gundidj clan of the Jaara tribes, who inhabited this region for millennia. Traditional stories include the local legend of giants throwing rocks at each other and creating Leanganook (Mt. Alexander) and nearby peaks. Volcanic eruptions can be traced geologically, to as recent as 10,000 years ago. The indigenous peoples created and transformed the landscape. They were the original ‘affluent society’ and the Dja Dja Wurrung were members of the oldest living culture on Earth. Their spirits inhabit the landscape, and their People and Culture continue.